Polk Monitor 4. 2 Way Bookshelf Speakers. Serial # 74340. Frequency Response: 35Hz - 25Hz. Weight: 24lbs/Pair. USED PAIR OF SPEAKERS WORKING IN EXCELLENT CONDITION. Speakers have been tested and both sound very nice. Tweeters and woofers and all in excellent condition. Speakers are 10.5" Tall by 6.5" deep by 6.5" Wide. One of the speaker grills has a small hole in it and the other has a light spot in the fabric. I cannot find any info as to rms capability so I listed it as 15 watts. I had the speakers hooked up to my Yamaha CR 2020 at 1/4 power. Speaker is 4 3/8 x 5 x 7 and weighs 3 lbs. Tweeter is 3/4 and woofer is 3 1/2. Polk Audio Monitor Series 2. Condition is Used. Without mounts and as pictured they are white with yellow tinged metal screen due to age. They sound great. One has small area parea of the casing that broke off. Polk Audio Monitor Series 4 41143 Speakers Set of Two. One small plastic piece broken on mount, but holds securely [see photo]. Speakers nice and surrounds soft. Vintage Polk Audio M4 Monitor Series 2 Bookshelf Speakers Pair. They are in excellent condition and sound great. 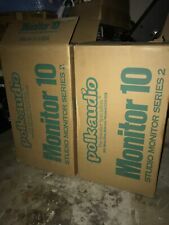 Up for sale is a nice set (2) Polk Audio Monitor Series 2 speakers. Speakers have a few scuffs but are overall great. Buy with confidence! These Polk Audio speakers sound incredible! You will receive everything you see in the pictures, if it is not pictured then it's not included. For sale is a pair of white Polk Audio M3 Monitor Series 2 100W 8 ohm Speakers. We add to our growing online inventory daily. We tested these speakers and they sound and work great. These speakers can be set on a shelf or wall mounted, but we do not have the brackets for them. Vintage Polk Audio M4 Monitor Series 2 Bookshelf Speakers Pair. Condition is Used. Shipped with FedEx Ground or FedEx Home Delivery. Polk Audio Series 2 Monitor Speakers. Excellent Condition! Polk Audio Bookshelf Speaker. model: Monitor Series II, M4. Polk Monitor Series 2 2-way stereo spkrs. Can stand vertical or slanted. Sound unbelievably natural. Great for surround sound system. 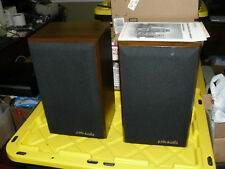 (2) Polk Audio - Monitor Series 2 - Bookshelf Speakers - Amazing Sound - Black. Good sounding and tested Polk Monitor 2's in white-. Sensitivity: 89dB. Suggest using as surrounds or second room/covered patio or garage speakers. Weight: 14Lbs. POLK AUDIO Monitor Series II Premium Sound 2-Way Outdoor Speakers w/ Tweeter BO! These speakers are in excellent preowned condition with not much if any signs of use. Only missing one tweeter cover. THESE SPEAKERS HAVE BEEN TESTED. THESE POLK AUDIO SPEAKERS ARE IN. THESE SPEAKERS ARESOLD. IN SUCH CASES, I SET ABOUT CORRECTING THAT PROBLEM BY FIRST CLEANING THE UNIT (INTERNALLY AND EXTERNALLY), NEXT I'LL TEST ITS FUNCTIONS AND PERFORM ANY NECESSARY SERVICE AND/OR REPAIRS (I OFTEN TRY TO UPGRADE WEAK COMPONENTS), THEN FINALLY, I TEST ITS FUNCTIONS AGAIN.